Yes, you read that right. Tonight’s cookbooks is The Kellogg’s Cookbook, and that means recipes with things like Cheez-Its, Rice Krispies and Special K. When I wrote this up for Recipes of the Damned, I made fun of a recipe that involved sauteed shrimp and Corn Pops. To be fair, the recipe sounded very good without the Corn Pops. This is what makes this cookbook worth perusing: Many of the recipes seem quite reasonable. This is because many Kellogg’s products are pretty simple: Corn Flakes, Rice Krispies, All Bran. I’ve made cornflake-crusted oven-baked chicken before, and probably everybody who’s not a vegan or a don’t-ask-don’t-tell vegetarian has eaten Rice Krispie treats. But some of the recipes are rather silly, either because they try too hard (for example, specifying Kellogg’s Stuffing Mix when any croutons would serve) or because the product they require is inherently silly. Like Cheez-Its. Don’t get me wrong. I really like Cheez-Its. They have a good strong mainstream cheddar flavor, and they’re an excellent salt delivery system, which is very important to me in a processed snack food. But in a souffle? I had my doubts, so I decided to find out. The recipe is fairly simple, though might be daunting to an inexperienced cook. 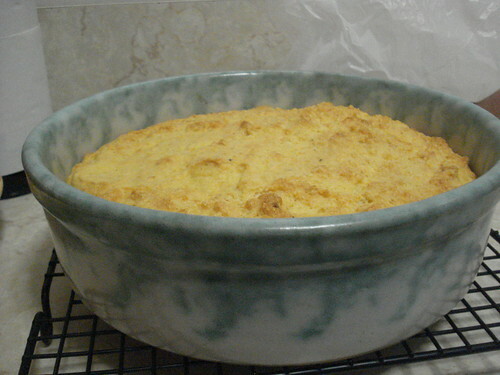 (Of course, if you’ve gotten past the word “souffle” you’ll probably be just fine.) 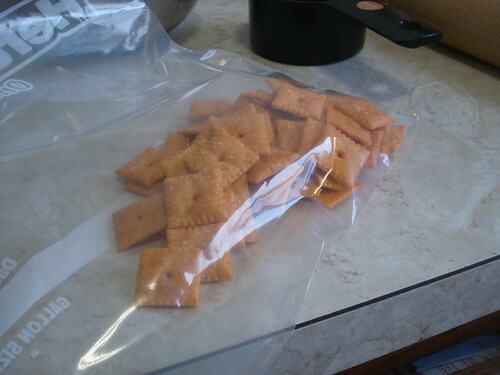 I began by preheating the oven and measuring out a cup of Cheez-Its and then crushing then in a plastic bag, using a rolling pin. 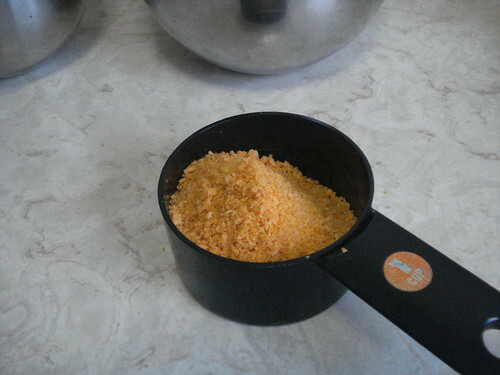 I poured the crumbs back into the measuring cup; they now reached about 2/3 of the way to the top. I’d expected them to lose a lot more volume. I set them aside and separated six eggs, then beat together the yolks slightly. I also grated about a teaspoon’s worth of a fresh onion. Now it was time to move to the stovetop. In a heavy saucepan, I heated one and a half cups of milk and half a stick of butter for about two minutes, stirring constantly, until the butter was melted. 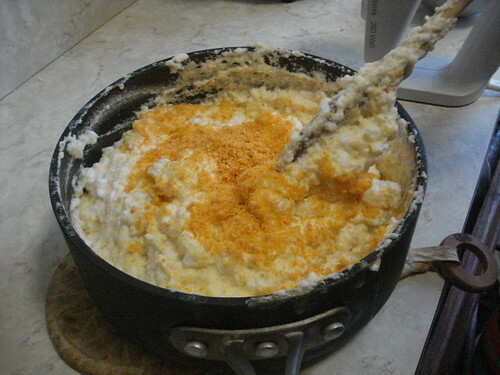 Then I added the grated onion and about half the Cheez-It crumbs and kept stirring, cooking for about five more minutes, until the mixture had begun to thicken and was close to boiling. 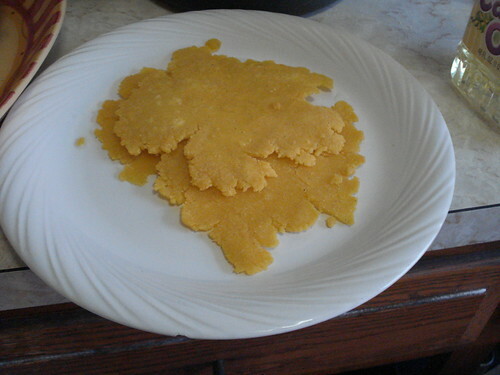 Here the Cheez-Its are functioning much like the flour in a roux; although the ingredients come together in a different order, this is essentially a bechamel sauce. With cheddar cheese flavor and quite a bit of salt. 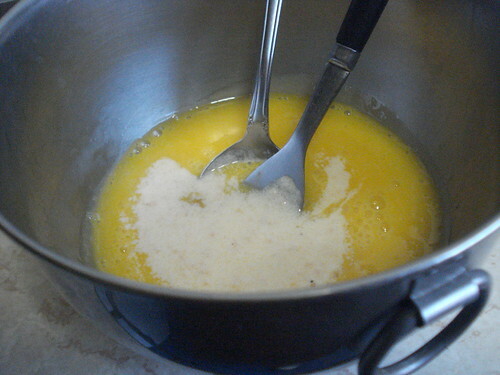 Now I spooned out a bit of the hot bechamel and added it to the egg yolks, mixing them together to warm up the yolks; this is called tempering, and it keeps the yolks from curdling when they’re added to the pan. Yolks tempered, I added them to the saucepan. They did not curdle. 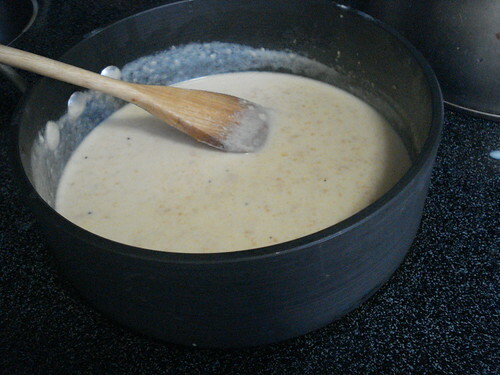 I kept stirring, letting the mixture cook for about three more minutes, then removed it from the heat. 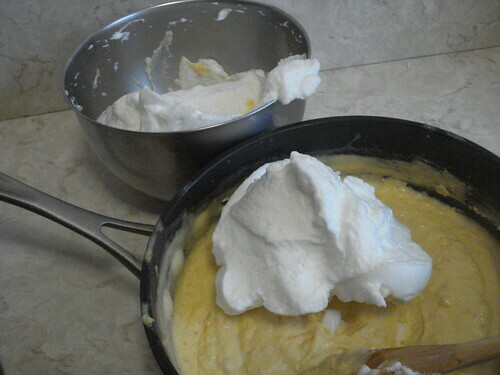 It was the egg whites’ turn now. Using an electric mixer, I beat the whites until they were stiff but not dry, which took less than two minutes by my estimate. (I wasn’t really looking at the clock; I was looking at the egg whites.) 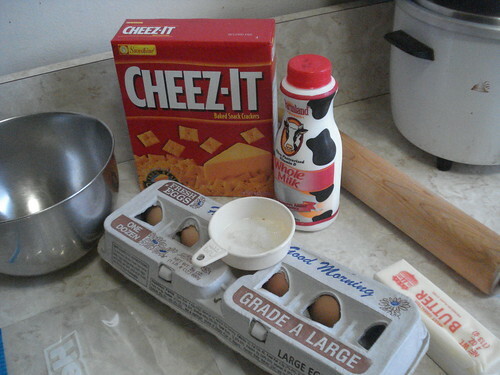 I then carefully folded the egg whites into the Cheez-It sauce. This is the tricky part, because you don’t want to overmix them, but you want to make sure you don’t have big pockets of unblended egg white or sauce. I folded in the rest of the Cheez-It crumbs, poured it all into an unbuttered baking dish, and put it in the oven for an hour and 15 minutes. While it cooked I finished up some kitchen tasks: I made salsa with fresh tomatoes and poblanos from the Greenmarket, and I washed a bunch of dishes. I found myself working gingerly. It occurred to me that a sufficiently loud noise or heavy vibration might knock the whole thing down. And boy, did my kitchen seem loud. The fridge cycling down with a thump; the poorly set drawers lurching into their grooves; a tomato rolling off the cutting board and into the sink. Outside noises sounded amplified as well: kids playing, motorcycles driving past, neighbors slamming garage doors. I half expected someone to pull into the alley in a bass-thumping boom box masquerading as a car. But my worries were groundless. 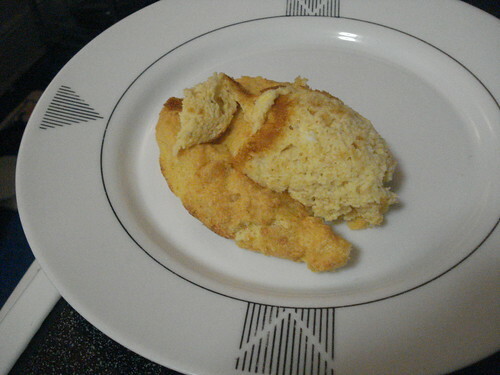 The baked souffle had risen, and stayed puffed, though it began to sink gradually once it came out of the oven. And when I dug into it with a spoon it quickly deflated. I spooned up some of the mixture and we carried it away with salad. I’m not sure if I got the consistency exactly right; it was somewhat soft and I didn’t know if it should be firmer and keep its puff more solidly. But it was a pleasing texture, and it tasted good. It tasted exactly like Cheez-Its. 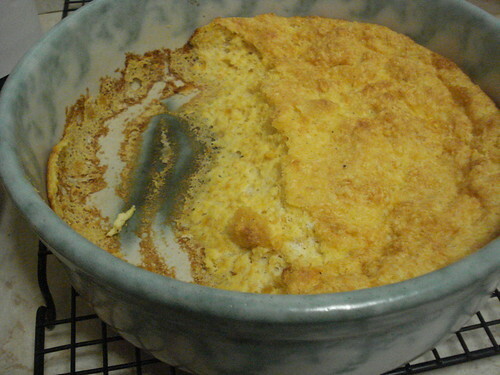 This is not a bad taste, though it’s a little weird in a souffle texture. Verdict: Success. But this is another silly recipe. 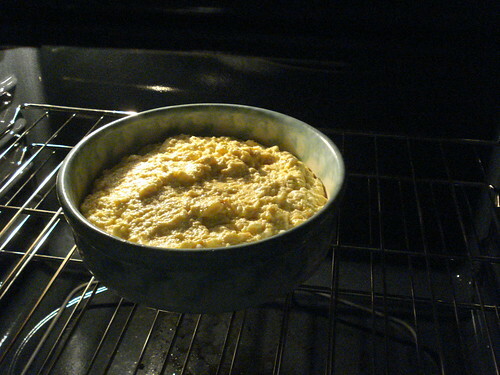 I want to make a real souffle at some point, but I think I’ll wait until the weather has cooled a bit more. The elegant puff seems like it might be a lovely way to present a fine chocolate or a really great cheese. But if I want Cheez-Its, the crunchy cracker is good enough for me. The Food and Life of Oaxaca: Holy Mole! I’ve had The Food and Life of Oaxaca for a number of years, but have never cooked from it until now. This is partly because when I lived in Portland, I wasn’t sure where to find the authentic Mexican ingredients. Then I was supposed to use it in November, but November sort of spun out of control. And in fact I made the dishes nine days ago, but by the time I was done that night I didn’t have time to format and load my photos and start writing before I had to get my suitcase packed and get to bed for an early morning flight. So here I am, better late than never. If you are coming to Oaxacan food, it is better to do it late than never. This stuff is amazing. I have only last Sunday’s dinner to judge by, I admit; I have never been to Mexico (though I’ve been within shouting distance a couple of times, but was too well-mannered to do that), so I have never had Oaxacan food in Oaxaca cooked by Oaxacan cooks. I think I need to do something about that before long. For those who don’t already know, Oaxaca is a state in Southwest Mexico in the area where the Pacific and the Gulf of Mexico draw near each other. It features rugged mountain ranges and fertile valleys, and was home to the Zapotec people starting thousands of years ago; they dominated the area until the Aztecs and the Spanish made their conquests. I learned all this from the introduction to this cookbook, which is a rich resource for both history and cookery. Because Oaxaca’s growing areas range from tropical lowlands to cool mountains, the variety of food available is immense, and the recipes offer a vast range of choices: meats, seafood, rice, corn, beans, fruits, vegetables. It was hard to choose what to make, though I was able to narrow the selection down right away by the constraints of our dinner party. One guest is lactose-intolerant, one is vegetarian, and Scott avoids shrimp because it exacerbates his gout. I ruled out meat-centered dishes, food that called for cream or cheese, and a surprisingly vast list of items made with ground dried shrimp. I bet they were good, but with me gone for three days, Scott would have nobody to tend him while his foot swelled, so I struck those off the list. Fortunately, I did not have to rule out any mole sauces, the heart of Oaxacan cuisine. 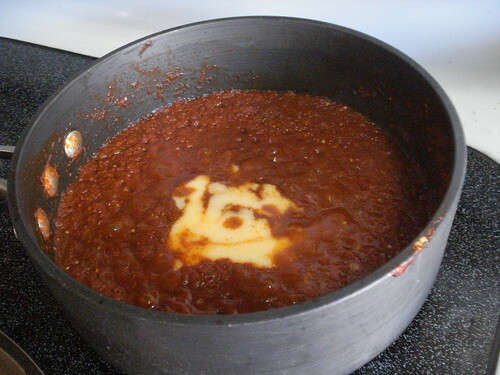 Most Americans are probably familiar with mole as a spicy sauce that contains chocolate, but in fact the key to a mole is ground dried chiles, and only a few of the sauces presented include chocolate. Author Zarela Martinez dances around the difficulty of defining mole — it can mean many things to many cooks — but suggests that a mole will be a sauce that has a large number of ingredients, most especially dried chiles, that can be used to give depth and flavor to a broad range of ingredients. 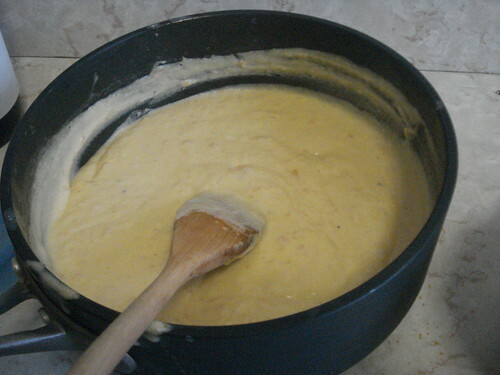 The cookbook gives recipes for the sauces and meats or seafood to go with them, but notes that any sauce can be used with any suitable meat, vegetables or seafood. 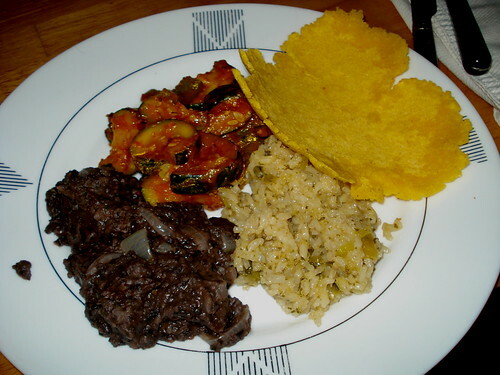 I decided to try five dishes: a mole, a pepian (similar to a mole but with pumpkin seeds), refried black beans, rice with tomatillos, and corn tortillas. I made a list and set out in the neighborhood, prepared to go to several stores to find all the things I would need. I didn’t have to do that. 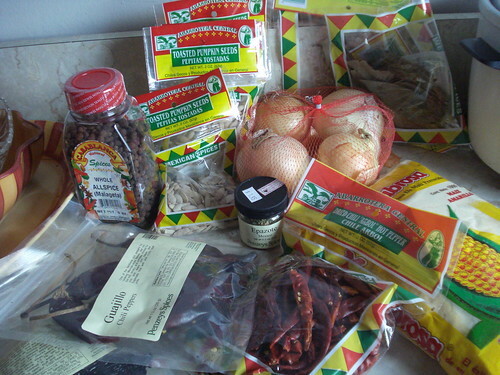 I started at Key Food, where I had seen a section of Mexican ingredients. 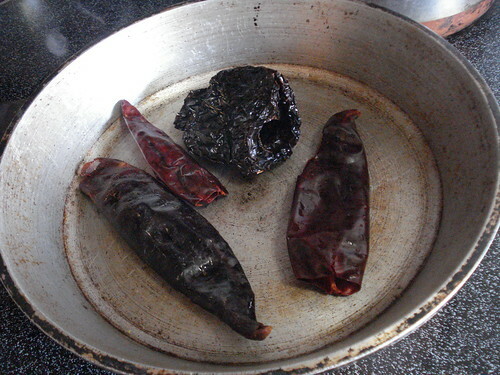 Guajillo, ancho, and arbol chiles, dried? There they were. 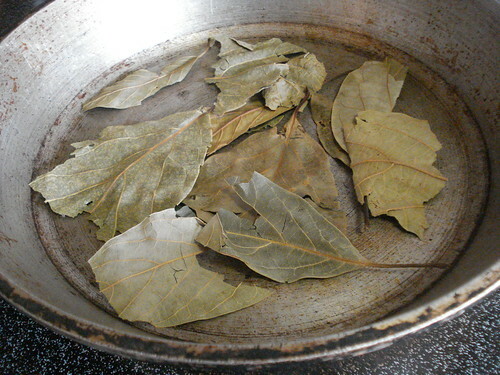 Dried avocado leaves? Check. 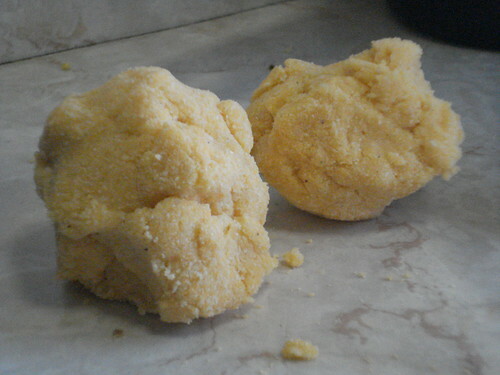 Masa harina? Several sizes of bags. Fresh tomatillos and jalapenos, dried black beans, cilantro, all were ready to hand. The only things I still didn’t have when I left that store were a hard green tomato (but I decided a standard hard red supermarket tomato was essentially the same thing), epazote in either dried or fresh form, and a tortilla press. I found dried epazote at Penzey’s, and with garlic, onions and rice already in my pantry, I was ready for a busy day. I read through the recipes and saw that the prep was far more elaborate than the actual cookery in most cases; the stovetop time for a complete dish was far shorter than the time spent getting all the ingredients ready to combine. So I just tied on my apron, emptied the sink and got started. 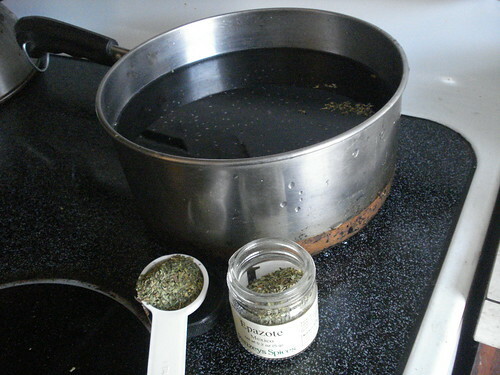 I was cooking black beans from scratch, so I washed and picked through a bag of dried beans, then put them into a pot with a whole onion, a head of garlic, and some dried epazote, an herb similar to but not quite like cilantro, which apparently is standard for cooking dried beans. It’s going to be for me from now on; the green flakes had a delightfully grassy and savory flavor. While those cooked, I started to on several rounds of skillet dry-roasting. 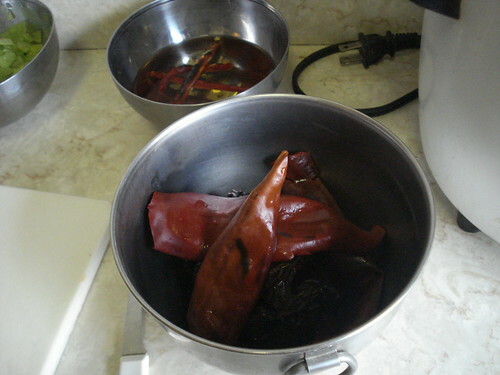 First up were the dried chiles; for each dish that called for them, I rinsed the appropriate dried chiles, shook off the excess water, then pan-toasted them for a minute or so on each side, until the remaining water droplets had disappeared and the chiles began to release their scent. I then pulled off the tops and extracted the seeds and pith of each dried pepper, as best I could; this turned out to be easier than I expected. I put the peppers into bowls (grouping each recipe together), poured boiling water over them, and let them soak for about half an hour. The next things to dry-roast were the fresh vegetables. 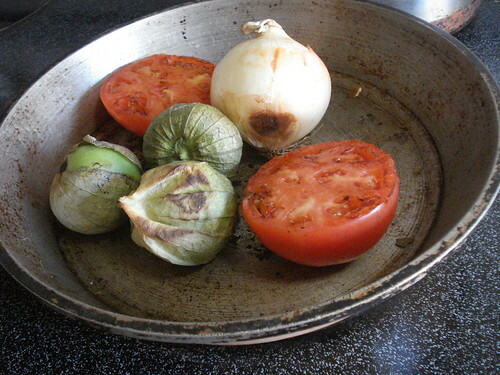 Jalapeno peppers, an onion, tomatillos in the husk, that not-truly-green but truly hard tomato, and garlic cloves in their peels all spent some time in that dry skillet. 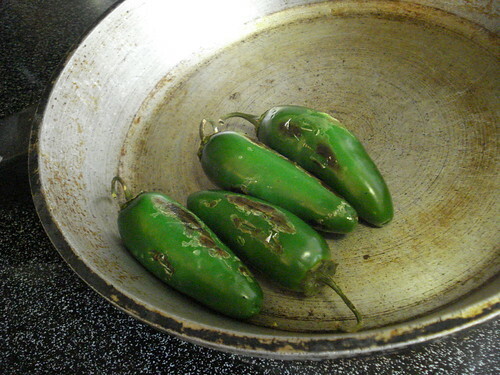 I turned them periodically to give them even charring or discoloration. When each item was done I removed it to a bowl (again, grouped by recipe), and removed the husks or peels. The jalapeno peppers actually went into a paper bag to rest for a bit before peeling; this was supposed to make the skins easier to slip off but I probably needed to roast them longer. The other key item of vegetable prep was to soak and then dice some tomatillos for the rice. 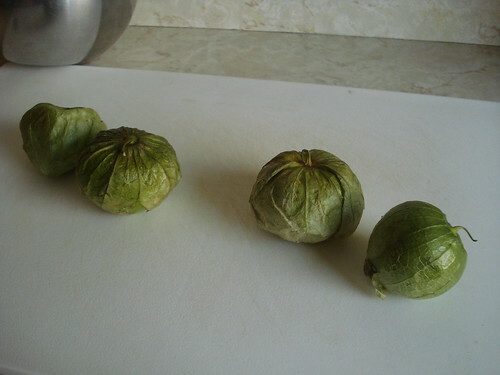 Tomatillos have a center pulp that can be sticky, which works well for some dishes but not for others, and the rice dish called for its removal. 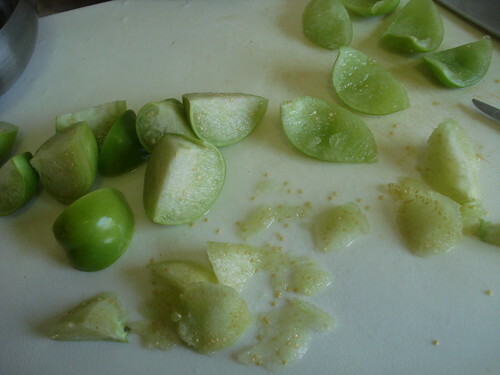 So I pulled off the husks and quartered four tomatillos, soaked them in cold water for about half an hour, then cut away the center pulp and diced the flesh. Often when I’m writing these blog entries I will say “at this point I did X,” but that’s a bit tricky to do here. I was working constantly, and I hadn’t made a cooking plan — and if I had, I would have been way off it within half an hour because I’d never done most of these things before and didn’t really know how long any given task would take. So I just kept working and paid attention to my timers to keep up with when I needed to drain off the soaking water for chiles, when I needed to add salt to the beans, when I needed to lower the heat. Now that I’ve made these dishes I could probably write an accurate cooking plan for the next time I do it. For the purposes of this blog entry, I’m going to shift now to describing how each dish is made in turn. I’ll start with my dish of failure, pepian con pollo, which was going to be pepian sin pollo anyway because I wasn’t going to use chicken. A pepian is a pumpkin-seed sauce, and you don’t have to gut a pumpkin to get its seeds; retailers in many areas, certainly in my neighborhood, offer both hulled and unhulled seeds. And this is where I went wrong, because I didn’t double-check the recipe when I made my list and I bought unhulled seeds. 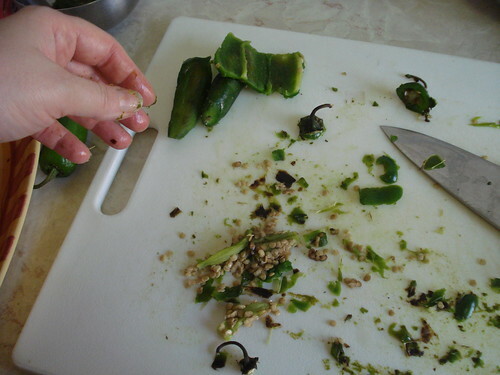 The recipe required hulled seeds. The difference is not unlike that between peanuts in the shell and peanuts out of the shell. So imagine making peanut butter with peanuts in the shell. 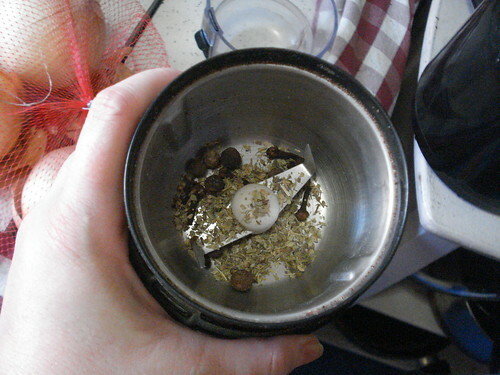 I realized my mistake at a fairly advanced point; I had toasted jalapenos, and ground cloves and allspice berries and oregano, and was ready to throw it all into the blender with the seeds and some broth. 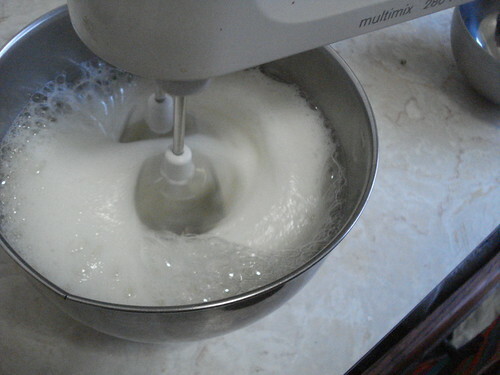 Hmm, I thought, the balance seems pretty liquidy; perhaps I can go ahead and blend it and then sieve out the hulls. This was the wrong answer. 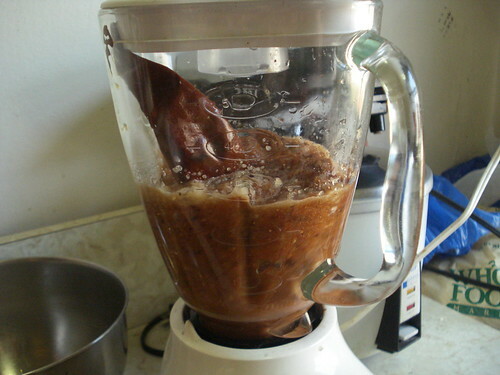 Within about 10 seconds my blender began to make unhappy grinding noises and I could smell its motor overheating. 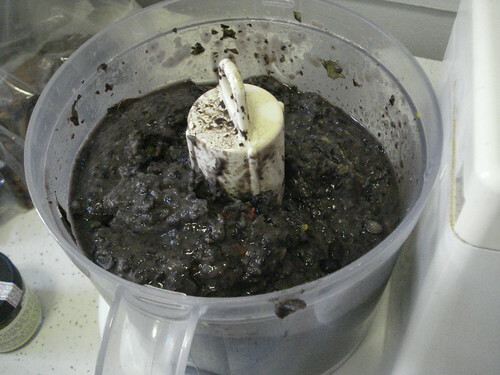 I turned off the blender, dipped in a spoon and tasted the liquid. Absolutely inedible. I felt very Iron Chef (“I was going to have five dishes but one of them didn’t work out”) as I disposed of the chalky, salty slurry. Fortunately, the mole went much better. Amarillo mole takes its name from the deep orange-yellow color, and mine would have been a bit yellower if my tomato had been genuinely green. 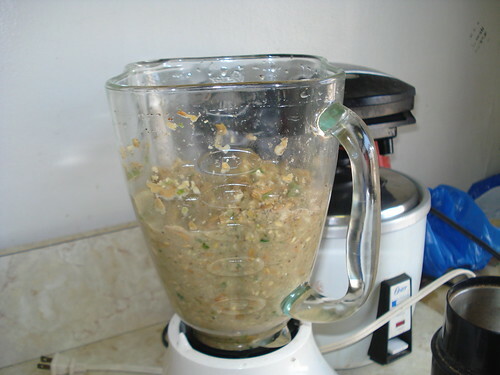 In a blender I combined three tomatillos, pan-roasted and husks and stems removed; one onion, pan-roasted and peeled; two garlic cloves, pan-roasted and peeled; one hard tomato, pan-roasted and peeled; three dried guajillo chiles and one dried ancho chile, rinsed, dry-toasted, seeded, soaked and drained; and 10 peppercorns and 8 cloves, ground together in a spice grinder. 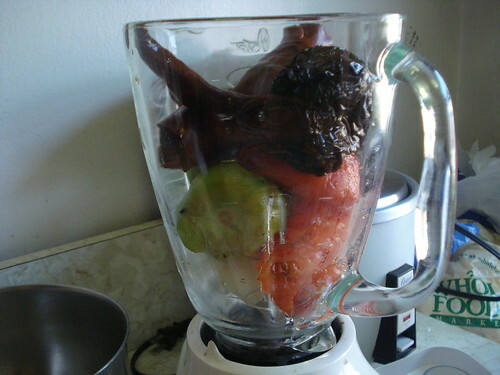 I put on the lid and hit puree, and within a few minutes I had a gloriously deep orange, smooth, thick liquid. At this point I was supposed to force the sauce through a medium-mesh sieve, but I didn’t have a medium-mesh sieve, only a fine one, and I was running out of time and patience as well. I then heated some oil in a saucepan (the recipe recommends lard but when you are cooking for vegetarians that’s not happening), then added the sauce and covered and cooked it for about 10 minutes. While it cooked I mixed two teaspoons of masa harina with some water; when the 10 minutes were up I added it to the sauce and whisked it in. 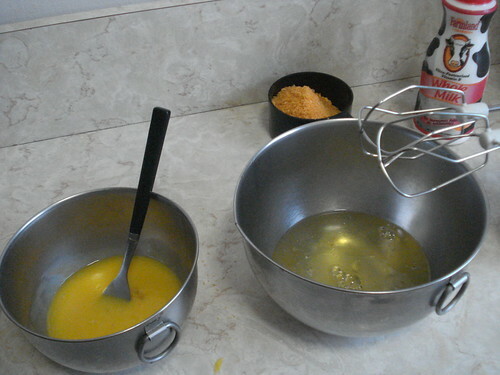 At this point the recipe says to whisk constantly for another 15 minutes, but I was far too occupied with the other dishes coming together to do more than occasional whisking, and it turned out just fine. 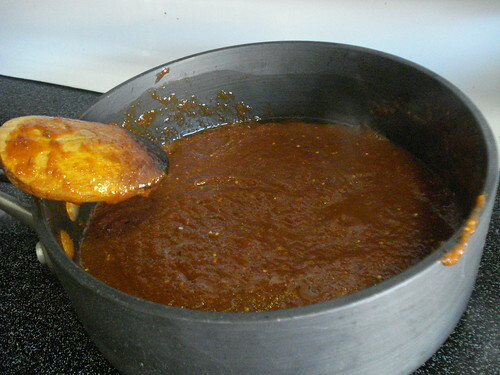 The sauce was done ahead of the other dishes, which was my goal; I set it aside and kept going. The beans were the next focus of attention. I had started cooking my dry beans, and after they’d been cooking about 30 minutes I tested them fairly often for doneness, because this can vary depending on how old the dried beans are. These took probably an hour to cook, maybe a tad longer; it’s possible they’d have been ready a little sooner if I had waited longer to add the salt, which I think made them slightly tough, but they softened after a while. I drained the beans, reserving about 1 1/2 cups of the cooking liquid and discarding the onion and garlic. 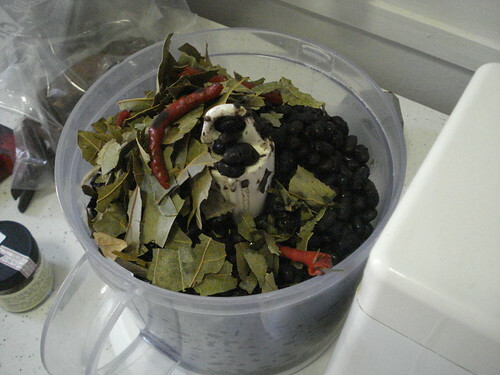 When they were cool — or, more accurately, when I had time to pay attention to them again — I put the beans into a food processor (I was giving the blender a rest after the pepian disaster) and added three dried arbol chiles (pan-toasted, soaked and drained) and 12 dried avocado leaves (pan-toasted and crumbled). I pureed these until they were an even consistency. I was supposed to push these through a sieve too, but I had decided by this point that if things were a bit coarse I would call it “rustic” and invoke Julia Child’s admonition to never apologize. I set aside the pureed beans and sliced three large onions into thin rings; I heated some oil and cooked the onions in it for about 8 minutes. Then I scooped out the onions and added the bean puree. I was supposed to discard the onions, but I had a qualm about wasting them, decided that rustic is as rustic does, and added back perhaps one-third of the onions. I mixed it all together, covered the beans and turned down the heat, and let them cook for about half an hour, stirring when I thought of it. Which was at least twice. The arroz con tomatillos also required some food processing. 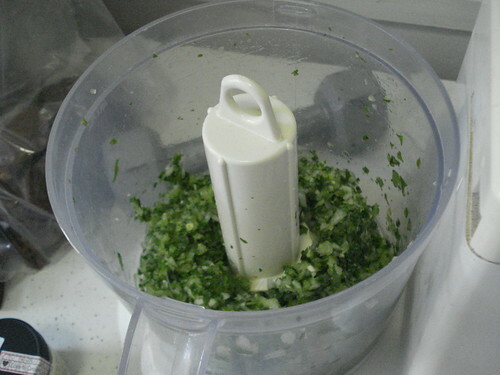 I took the tomatillo flesh that I had diced and put it in the processor with a chopped onion, a chopped clove of garlic, and about half a cup of fresh cilantro leaves. A few whirs later and I had a lively green puree. In a saucepan, I heated some oil, then promptly forgot about it until I smelled it scorching. I pulled the pan away and put it on the windowsill to cool. In a different saucepan I heated some oil and paid attention this time; when it was hot but not scorching I added a cup of long-grain dry rice, stirring it for several minutes until it began to color and smell nutty. The recipe says it should “sound like sand as you stir it,” and this is surprisingly accurate; I can’t improve on the description. I added the tomatillo puree and stirred the mixture for about three minutes more; then I added 2 1/4 cups of vegetable stock, covered the pan, reduced the heat, and let it cook about 18 minutes. Now it was time for the final piece, the one with the least prep time and most cook time, for a change of pace: corn tortillas. 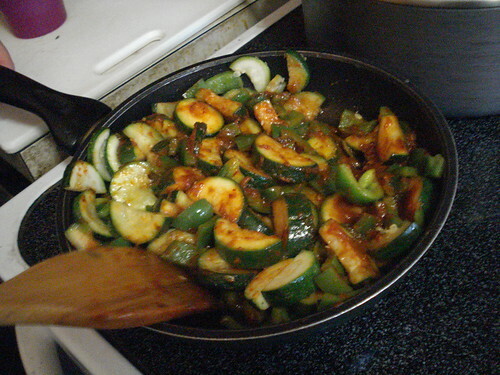 (I took a few minutes to cut up some zucchini and green peppers to saute with mole, but I ended up delegating the cooking on that to a helpful guest.) Corn tortillas are easy to find in grocery stores; really good ones, not so much. 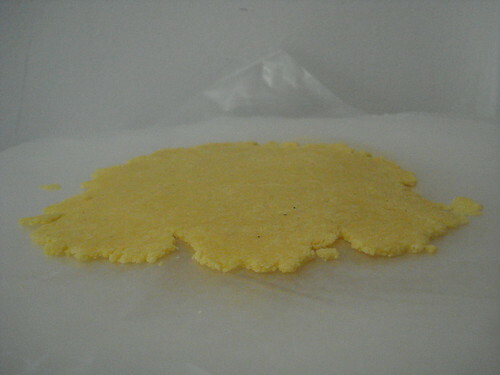 The cookbook advises finding fresh masa, ground from lime-treated corn, which can be obtained from tortilla manufacturers. There is one in Queens, but not in my neighborhood, so I opted for the second-best step, combining masa harina (not cornmeal) with water and shaping it into balls. Once you have a tortilla dough ball, you are supposed to flatten it with a tortilla press, but I didn’t have one; the book says that you can use a flat-bottomed pan instead, which after my hardest pressing turned my corn dough spheres into inch-thick round slabs. I decided to roll them flatter from that point with a rolling pin, and was able to produce tortillas with a fairly consistent thickness but jagged edges. Pardon me, rustic. 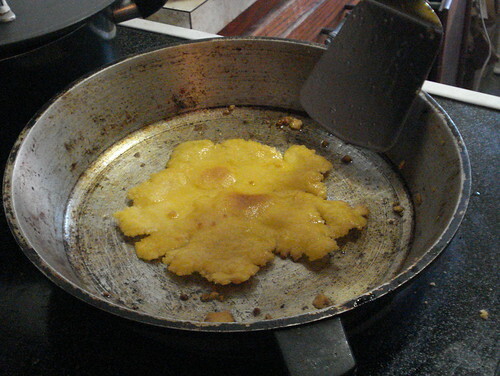 Once I’d flattened the tortillas (which I stacked in layers of wax paper to keep them from drying or sticking together), I heated some oil in a skillet and cooked each in turn, about 90 seconds on the first side and 60 seconds on the second. The first was not quite the best texture but the remaining 11 were pleasantly toasty. I toasted and turned while Scott and our friends set the table, cooked the zucchini and peppers, and plied me with lemonade. The tortillas were not flexible enough to roll as for soft tacos, but they made a very nice flat base for the other dishes. Finally the food was all cooked and we were ready to eat. I was worried that the dishes wouldn’t be good enough after all my labors, and maybe they wouldn’t have passed muster with a Oaxacan cook, but everything tasted fantastic to us. The beans were rich and savory, with a good smooth texture even in their rustic un-sieved condition. The rice was really delightful, fresh and bright and nutty. The tortillas had a deep corn flavor that put them far beyond store-bought. And the mole, oh, the mole! It was remarkable. Despite the dominance of chiles the sauce was not so much hot as complex and multi-layered; it had smoky and sweet overtones. Verdict: Success. (Even despite the pepian failure.) I will be cooking from this cookbook again.